In 1894, the publishing house of Archibald Constable & Co. launched a series of novels by well-known authors called The Acme Library. The two tales paired in this volume were the first two entries in the set. Unlike Constable's publication of Dracula in 1897, the Acme Library was a failure, and copies of books in the short-lived series are quite rare today. 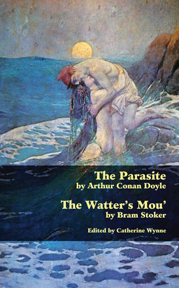 In Arthur Conan Doyle's The Parasite, a sceptical scientist engages in dangerous experiments with Miss Penelosa, a hypnotist with deadly powers. Bram Stoker's The Watter's Mou' is a thrilling tale of romance and smuggling along the Scottish coast. These two short novels are fascinating in their own right, but also in how they reveal different sides of these two authors, best known for their creations Sherlock Holmes and Dracula. This edition features the unabridged texts of both novellas, taken from the scarce British first editions, and includes a substantial introduction by Catherine Wynne tracing the many parallels and convergences of the two authors' lives and literary careers. Also included are explanatory footnotes and an appendix containing Doyle's haunting story "John Barrington Cowles," Stoker's surreal "The Coming of Abel Behenna," and a 1907 interview of Doyle by Stoker.